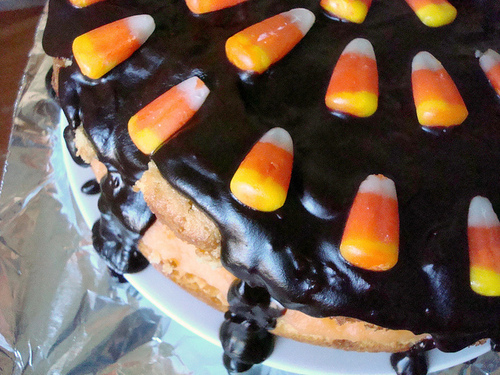 Candy corn Boston cream pie!Being thin doesn't feel as good as dessert tastes, and other wisdom. No idea what the blog post says, but look at this cake. JUST LOOK AT IT. Dominique Ansel (AKA Cronut Creator) to open a bakery in Tokyo. Gastropod: an awesome new podcast! The first episode focuses on the history of the fork. Baby Ruth Vs. Babe Ruth: what's the connection? Muffins 101. My kind of education. Using colors to convey motion in your artwork. A wonderful essay by me. Canning just got easier. Really. Pumpkin cupcakes with maple frosting. Not that there's anything wrong with cream cheese frosting, but I like this different option. Keep your cakes from falling in the center! A valuable article. I was really honored that the James Beard Foundation featured my writeup on "what is pumpkin pie spice?". "Baking With My Homies" hip-hop inspired cookie cutters. Book of the week: 175 Best Mini Pie Recipes: Sweet to Savory by Julie Hession. Because seriously, how many moments in life aren't made better with mini pies? ?